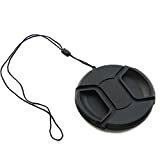 The DynaSun Centre Pinch Snap-On Lens Cap front lens cap with a squeeze, spring and snap-on mechanism. They’re easy to put on and take off, especially when using lens hoods, and they stay on. Lens caps protect your lens from scratches, fingerprints and the elements when the lens is not in use. It’s always good to have a spare in your camera bag, too. With the Cap Keeper, don’t lose any more lens caps. One end of the holder has an elastic band which attaches securely around the lens barrel. The DynaSun Centre Pinch Snap-On Lens Cap front lens cap with a squeeze, spring and snap-on mechanism. They’re easy to put on and take off, especially when using lens hoods, and they stay on. Lens caps protect your lens from scratches, fingerprints and the elements when the lens is not in use. It’s always good to have a spare in your camera bag, too. This entry was posted in Discount Photography and tagged 55mm, Camera, Canon, Centre, Cord, CP05, DynaSun, Front, Fujifilm, lens, Nikon, Olympus, Panasonic, Pentax, Pinch, Samsung, Sigma, Snapon, Sony, Tamron by Ball Photo. Bookmark the permalink.